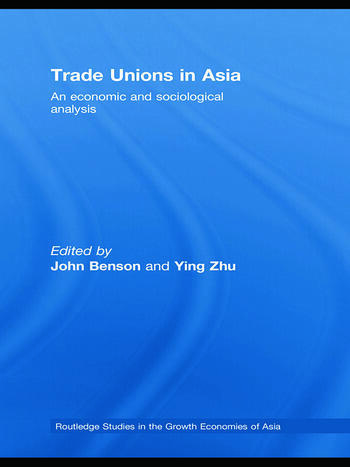 Offering a comprehensive account of the role of trade unions in Asia today, this book, put together by two editors who have published extensively in the areas of business and economics in Asia, covers all the important Asian economies: both developed and developing. Making a vital contribution to the very small amount of literature that has been published on this topic, this book focuses, in particular on how trade unions have organized to represent workers and the strategies they have adopted. It discusses the issues surrounding wages and working conditions, health and safety, women’s employment opportunities and human resource development, in the context of the major regional economies, including Japan, South Korea, Taiwan, Hong Kong, China, India, Vietnam, Thailand and Indonesia. This is an essential read for both professional and postgraduate students , studying or working in the areas of Asian business. John Benson is Professor and Head, School of Management at the University of South Australia. He is the author/editor of nine books and over eighty journal articles and book chapters. He has had extensive consultancy experience with unions, business enterprises and government departments. His major research interests include Japanese management and unions, the restructuring of Chinese industry, outsourcing, and knowledge workers. Ying Zhu is the Director of the Master HRM and an Associate Professor in the Department of Management and Marketing, the University of Melbourne, Australia. He has published a number of books, chapters and journal articles covering industrial relations, human resource management, cross-cultural management, business and economic development in East Asia and Australia. His recent publications include Unemployment in Asia (co-edited with J. Benson, Routledge, 2005) and Management in Transitional Economies: from the Berlin wall to the Great Wall of China (co-authored with M. Warner et al, 2004).